Reasonable loadings on the trains today, busier than yesterday in fact. Pleasing for late February. 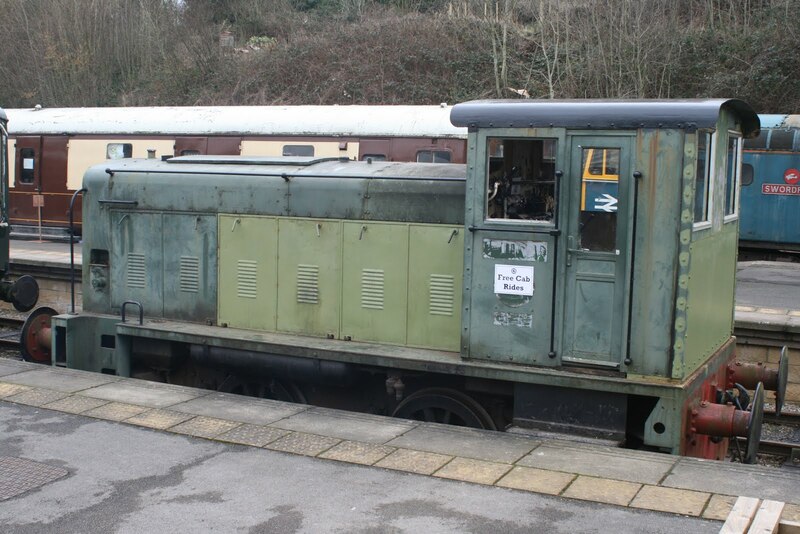 Down the yard, Faraday had a fuel leak checked and the SO coach had some work done to a vacuum cylinder. The CK coach had body work repairs carried out at one end before it is repainted. An Owner's Rep from Northamptonshire came and gave the newly-arrived Class 31 a good look over and he gave it a bodyside wash, with the assistance from some of our guys, to remove the remnants of Storm Doris which applied itself on Thursday during the move. A rather damp, grey day down at Derbyshire's favourite branch line but our scheduled Wirksworth to Duffield service still enjoyed reasonable loadings. Down the yard the inaugural meeting of the newly formed Ecclesbourne Valley Railway DMU Association was held in the training room. 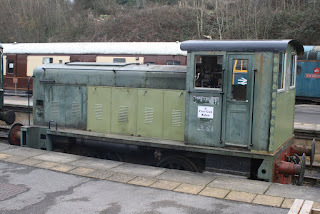 Following this a comprehensive shunt took place to ensure the LMS brake van is in place for its fitness to run examination before the footplate experiences start. You will be aware that the railway has been hosting a film crew and actors all week with filming taking place at night. For the first four nights Wirksworth station was the location but last night saw a very atmospheric set at Shottle Station. The attached photograph shows a rehearsal for a scene which depicts the mystery plot starting to unfold. A much better day weather-wise than yesterday! First thing this morning, the newly arrived 31 was started up and shunted round to the yard away from the loading point to allow the testing customer to get on the track. However, in the end they didn't actually go on the track instead opting to tinker with the machine in the car park. Boffins from Burton were on site today investigating and hopefully rectifying a few niggles that have developed on the Class 33 over the last few weeks. Bring on the gala in a few weeks time! This afternoon, Messers Boultbee, Tait and Watts set sail from Wirksworth in the road rail Land Rover to inspect the line following the bad weather yesterday. 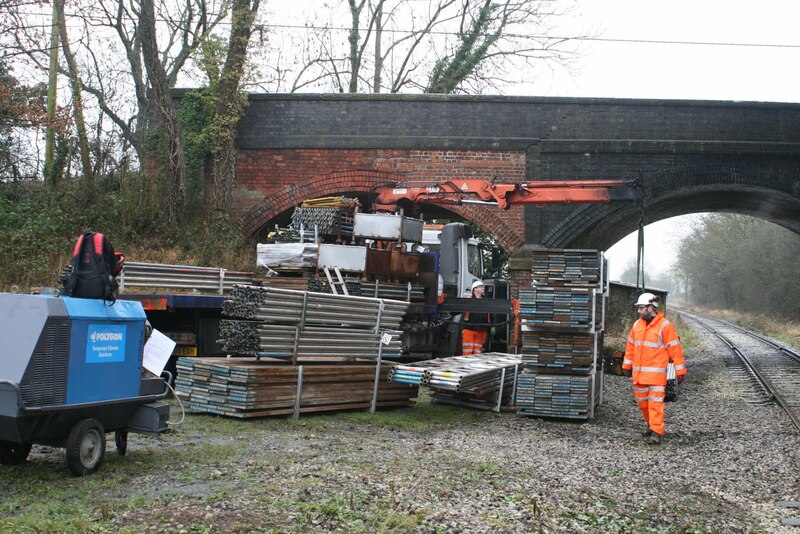 A most useful exercise as they encountered no fewer than 4 trees that may have been a problem to rail traffic but happily they were dealt with using the equipment they took with them. A useful exercise, not only for tomorrow's service but also for tonight's filming. It is the last of five night of filming by the students from London tonight. Hopefully they have got some good footage to produce their film and we look forward to it premiering soon! Doris Day! Anyway, a utterly foul day weather wise but everything in the vicinity of Wirksworth Station seems to have survived but we are yet to check the line. Mobile portions of filming scheduled for this evening has also been postponed until tomorrow night because of the weather. That said, a defective starter on LJ Breeze has been removed for attention and we hosted a MyTestTrack customer who braved the elements to continue their certification process. 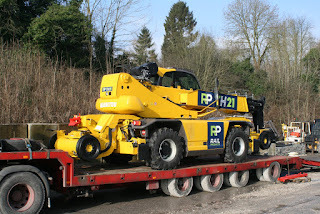 We took delivery of a 107 ton parcel late this afternoon in the form of 31206. 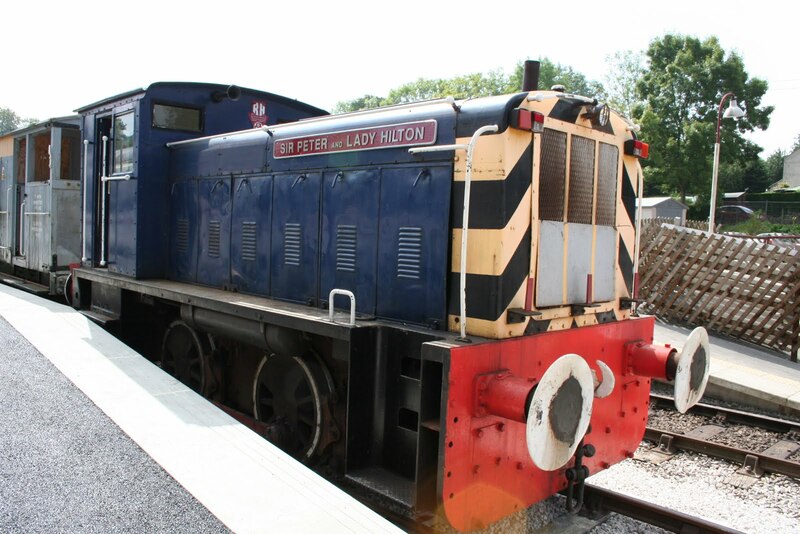 The locomotive is with us for two seasons and will feature at the Diesel Locomotive Weekend in a few weeks time. A whole lot of concrete! The first of six days of trials and testing with this splendid concrete mixer that can produce the precise amount of concrete required and vary the strength of the mix as required. There are three days of empty tests followed by three days in its loaded configuration. 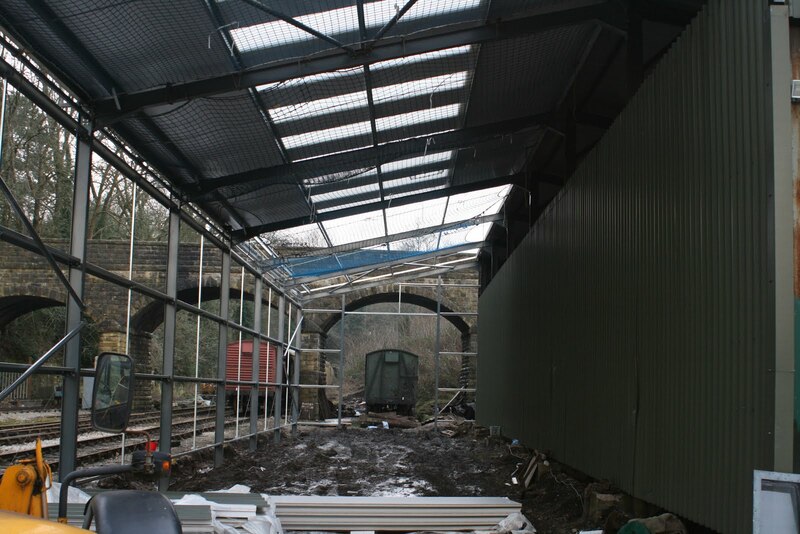 The other photo is of progress on the Maintenance Facility extension where preparations for fitting the roller shutter doors was underway. Much milder today and pretty busy for a February Sunday. One of the two cars was well loaded with nearly 70 on the first trip out at 11:15. By the end of the day we had beaten yesterday by a whole fifty pence piece (or maybe two twenty's and a ten, I dunno). Down the yard, the SO had a vacuum test and Faraday had the axle bearings inspected. 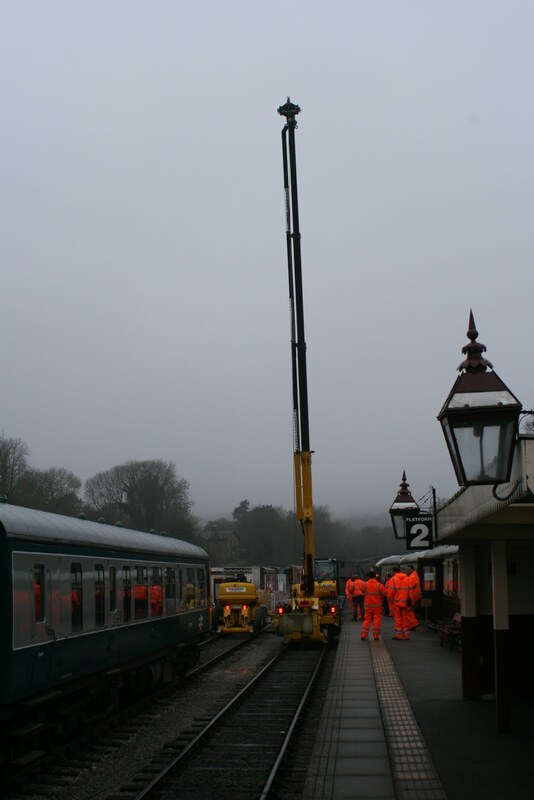 The train for this weeks filming was brought down to the platform and the crew shown some of the quirks of railways. I know I tend to start my reports with reference to the weather and tonight is no exception. Wirksworth must have its own micro climate as I'm sure its always 2 degrees colder here than the rest of the UK. Today started off as a cold grey morning but by midday we were enjoying some sun and blue skies. Platform one housed our volunteer recruitment displays which provided a great opportunity for our volunteers to meet each other and generally talk all things railway. However, the main purpose of the event was recruiting additional volunteers to help us cope with the demands of a very busy season ahead and I am happy to report the event was an unqualified success with twenty plus new volunteers 'signed up'. It was also good to meet up with so many old friends from other heritage railways. Thanks go to everyone who assisted with the planning and delivery of the day including the owners of Faraday who provided free cab rides to our potential recruits. 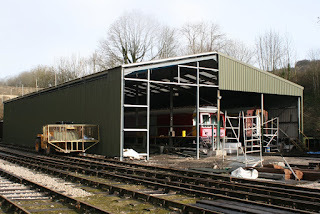 Our 7 1/4 gauge miniature railway took delivery of a new engine and the work of the group is on schedule for their grand opening at Easter. Down the yard the LMSCA and the Duke's restoration team continued work on their respective projects. The DMU Team were kept very busy with a complex brake issue with the 'Bubble Car'. Our scheduled Wirksworth to Duffield service enjoyed good loadings and a number of visitors and prospective volunteers enjoyed a yard tour thanks to Richard. Julie and Stewart operated our Model and Narrow Gauge railways respectively and congratulations to Eric H and his team who took our first wedding booking of the year. Finally well done to Eric B and Ollie who appeared live on BBC Radio Derby Breakfast Show this morning promoting our volunteering day. A very positive and rewarding day. PS I have tried sending a couple of photographs with this report but I getting an error message saying our mailbox is full! It was a great idea to show case a revived Faraday to give cab rides on Volunteers Day. It is a credit to the team who have brought it back to life after what was thought to be a terminal failure. 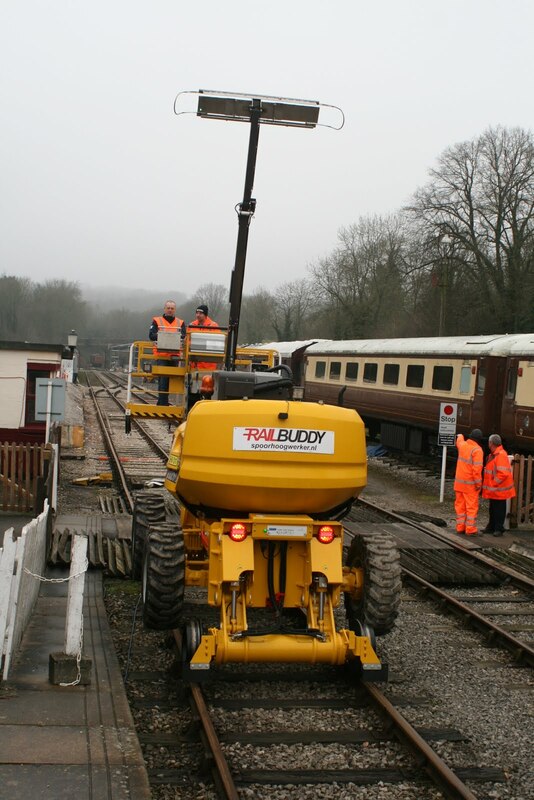 Very much part of the history of our Railway as the very first locomotive to arrive on site in 2002 due to the generosity of Martin Bromley. The photo of Faraday in happier times was when it was temporarily named "Sir Peter and Lady Hilton" in honour of our then Patron Lady Hilton. A quiet and mild day at Wirksworth where the thrust was around setting up for tomorrows Volunteering Day. This is a new event in our calendar aimed at showing potential volunteers what the railway does. We hope to see many of you at Wirksworth Station tomorrow! In the engineerium, the Mark 1 CK coach repairs and repaint continued this afternoon. We also hosted a Bronze Drive a Diesel Experience Day which turned out to be rather entertaining. After taking the two car DMU in the morning and enjoying lunch in the Pullman, they took the 33 to Shottle to bring back LJ Breeze for maintenance. The mildest and busiest day of the week on the trains with reasonable passenger numbers for the time of the year experienced. The Buffet was in full flow reacting to demand from our testing customers as well as serving our passengers . 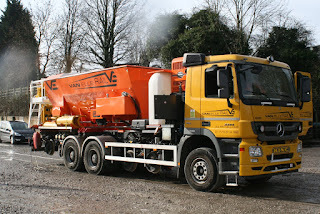 The test customers concluded 4 days on site today. Down the yard, the defective vacuum cylinder on 55006 was removed and the PW team sorted some bits out for Volunteering Day on Saturday. Reaching for the sky again! Our customer putting his machines through their paces for the benefit of a panoply of of potential users. Looked after by Eric Boultbee and all were fed and watered by Eric and Helen to universal acclaim. 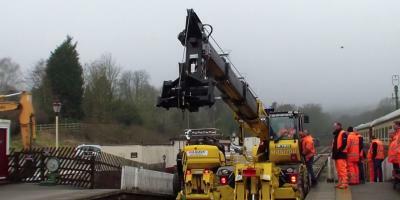 The first Tuesday train of the new operating season saw good loadings. The steam had a successful day with Barclay Henry Ellison passing its steam test and No 3 passing its internal exam prior to its future steam test. Fabrication of the copper pipework for Cathryn's lubricator kept the other half of the team busy. 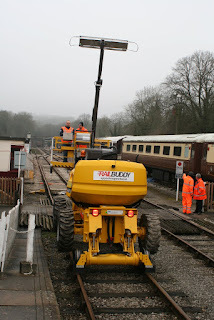 We are hosting the Dutch for four days and they were ably hosted today by Bob and Eric whilst Network Rail started to check that the machine performed as advertised. It was good to see the VCT measuring up for the fencing required following the removal of the dust dock and the steel erectors making good progress with the Maintenance Facility extension. The fact that the sun shone lifted everyone's spirits. The second day of the season was equally as cold, damp and miserable as the first with heavy snow in Wirksworth first thing. 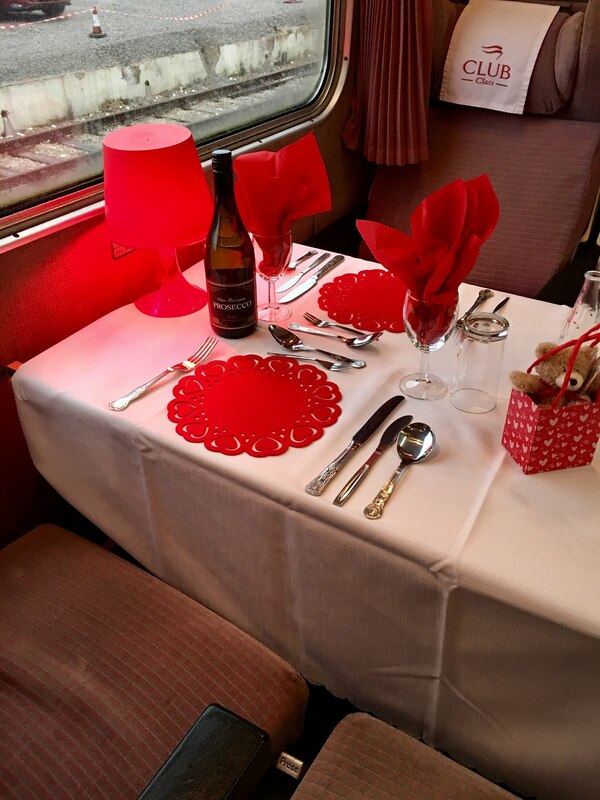 Having said that, it didn't seem to matter as we enjoyed even more passenger than yesterday including ones booked in to our Valentines Experience. The Experience, which was sold out, included a fizzy ride on the train followed by a three course meal in the Pullman. Despite it being hard work, everybody really enjoyed it and many friends were made. Down the yard, the coaching stock exams continued and Faraday had one of the rods dropped off to inspect the condition of the axle boxes. Needless to say they hadn't been opened for a long time! Today's pic is of the Booking Office at Duffield in full swing. 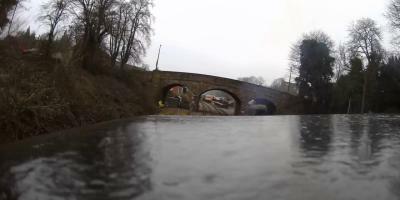 Artic weather conditions descended upon our railway today as the first scheduled service set off to Duffield and I'm afraid the weather did not improve throughout the day. Yet, our passenger numbers defied such foul weather and grateful thanks go to our train crew who carried on regardless of the cold and ensured our trains ran to time and our passengers were looked after. Meetings were the theme of the day in the Commercial Department: Firstly a meeting was held to review plans for EVR 150 events advertising followed immediately with a meeting with the Derbyshire Children's Holiday Centre in Skegness representatives to discuss plans for a major special event in June. This was then followed with a meeting with the London College of Communication to finalise their filming schedule commencing week beginning 20th February. The production team plan to shoot a short film drama called 'Gricer' to be screened at a number of International Film Festivals in the summer. There is a cast of 30+ actors and the filming, which is mainly in the evenings, will take in a two-car DMU at platforms one and three and various locations between Wirksworth and Shottle stations. The calm before the storm, we hope. The day before the start of the season. There was lots of prep going on today so that we are ready to open, especially in the Catering Department. 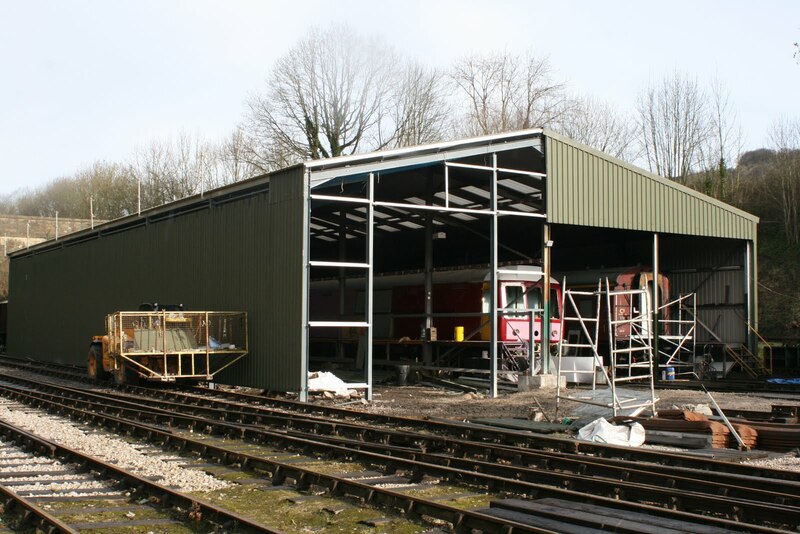 Today the work experience lad finished his week with us by helping out the chaps on the Miniature Railway which is an exciting new 7 1/4 gauge project developing at the end of Platform 1 at Wirksworth. They are aiming to have their phase 1 open at Easter. Down the yard, work continued on the repaint of the CK coach but other than that there were very few on site as it snowed most of the day, but fortunately didn't settle. The Maintenance Facility extension progress on a snow blown Friday together with impressive developments on the Permanent Way's luxury Bubble Car. Bitter today with a few snow flurries. Lets hope the snow forecast at the weekend makes the valley picturesque to start the season rather than keeps everyone away! You can tell the season is waking up, with trains being returned from their winter maintenance with body sides being washed and floors being mopped and vacuumed. The round of coach B examinations began with tyre sizes being measured and checked for the records and vacuum testing being done on the braking systems. 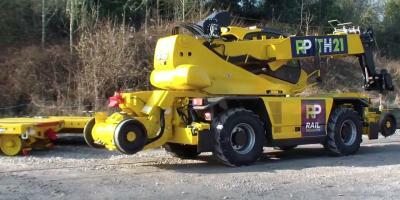 This, of course, is another kind of vacuum rather than the one which cleans the carpet! 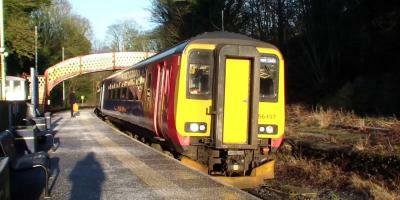 Down the line, the PW tripped a van to Duffield before changing some sleepers. The phones were also starting to wake up with a couple of coach parties booked in today, including one which takes up all of the available space on one day of the summer on train Afternoon Teas. We'll be looking to throw open the general bookings for these shortly. 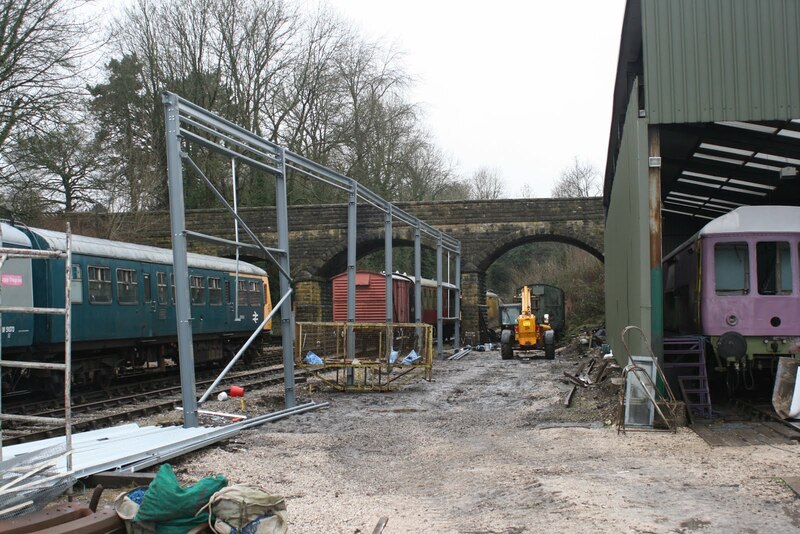 The final quiet Sunday before trains start running next weekend saw lots of progress down the yard. The steam team were working to prepare Henry Ellison for service; returning components to the loco which have been off for servicing. The Diesel lot had a good day, with the oil filters being removed from Faraday to try and identify them. If some spares can be sourced they will do an oil change soon. Over on the pit, Class 101 M51188 had a water pump changed in number No1 engine and the door hinge repair on Class 108 E53599 was completed and passed fit for use. That's two vehicles ready for service. A start was then made on making a heater serviceable for 50170. 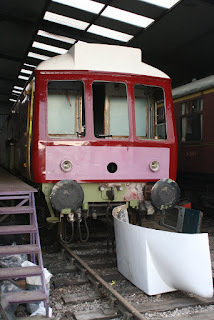 In the shed, the PW bubble had some gloss applied to the front which will enable the cab windows to be fitted. 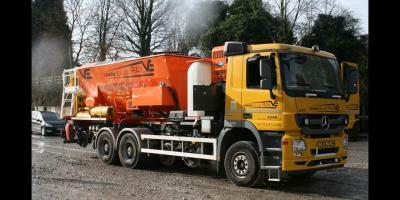 The PW tripped the works train back to Wirksworth this morning, arriving in time for chips. After lunch, they began to tidy up some mess left over from recent works. Meanwhile, the Maintenance Team repaired the drivers drop light on the Class 119, removed the faulty heater from 50170 and then retreated to the stores to overhaul some dodgey EP valves. Photos attached of Day 3 of the Maintenance Facility extension and materials gathered at Hazelwood for the refurbishment of Duffield footbridge (ours not the station). A road/rail vehicle was in operation transporting the material from Hazelwood to site.